What's in the Pro Upgrade and 7 Day Trial? 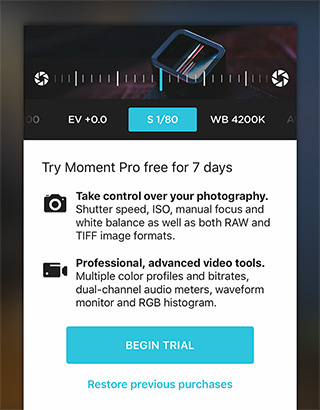 The Moment App is free to download and try. We own apps ourselves and don't like having to pay for it before we've used it. But in order to provide more advanced features we make those available in the app as a pro-upgrade. You can upgrade at any time or try out the pro features with a 7 day trial. At the end of the trial, you decide if you want to pay for the upgrade, or don't do anything and the tools will get locked up. Works with the DSLR-like shutter button on our Battery Photo Case. 3D Shutter - Control your shutter like a DSLR camera using Apple’s 3D Touch technology. Anamorphic - use the Moment Anamorphic lens to shoot amazing, letterbox style photos and videos. Apple Watch - use your watch as a remote to shoot photos or record videos. Split Focus and Exposure - Take control of tricky lighting scenarios. Exposure control - Get just the right shot with a broad range of real-time exposure compensation. HEIF and HEVC - Seamless support for the latest Apple file formats across photos and videos. Live Photo Histogram - Get your exposure right every time. Auto Video Stabilization - Make your videos buttery smooth. Moment Lens - select which lens you are shooting with. Dual Lens Control - Manually control which side of the dual lens you want to shoot with so you can use Moment lenses over either one. do not keep access to pro features. You do not need to do anything or cancel the trial--the tools will lock up once the trial is over and you will not be charged unless you specifically make another In-App Purchase for the pro features. You begin the trial from this screen, which will appear the first time you use the app. You can also access it by either selecting any of the paid tools, or by going to the app settings (icon next to the shutter button in the bottom controls).